A new arrival this week, and it something truly. Forming part of the forum bottles over at the excellent Bladnoch Distillery Forum. This distillery likes to do things differently, and apart from their own releases, they also offer forum only bottles from an enterprising range of distilleries. Literally you don't know what will appear next and that's part of the appeal I reckon! 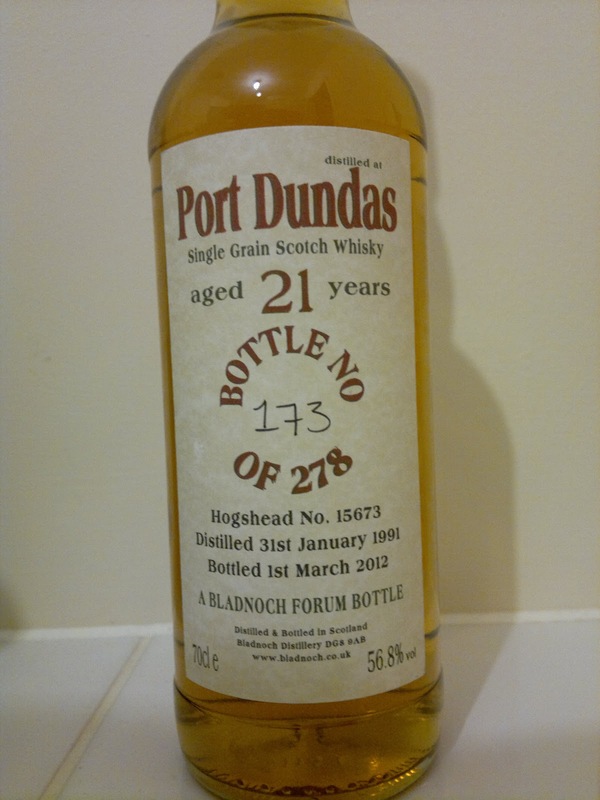 The latest, or so I thought it was until this evening's news of a Glen Spey 21 year old release, is from the Glasgow based Port Dundas distillery which closed in 2010. For under £40 a bottle, its hardly surprising that this run of 278 bottles sold out in under 4 days. Single grain malts are not something I've had much experience with and are often dismissed by whisky snobs. So, I am looking forward to trying this, once I've enjoyed what is already open. Whisky is not only a journey but one of restraint. We're all to eager to move on without fully appreciating what we have. 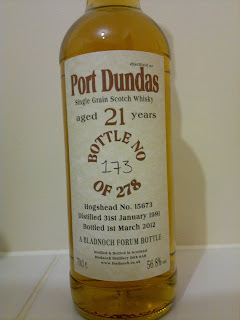 So my thoughts on this Port Dundas bottle will follow, I know I should post more tasting notes in general.